Army Black Knights Kate Murray. 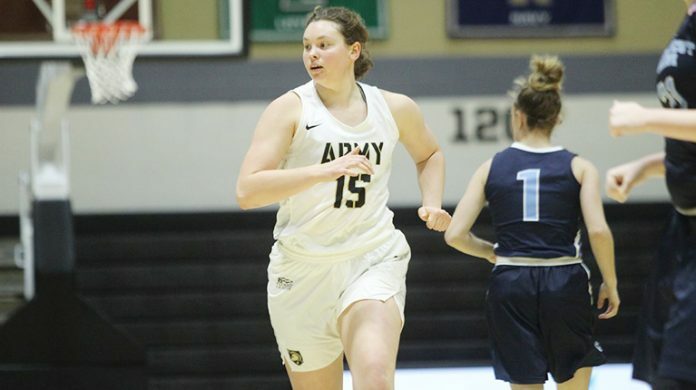 WEST POINT – Loyola jumped out to an early lead in the first quarter and Army couldn’t recover as the Black Knights fell, 70-51, in Patriot League women’s basketball action on Saturday afternoon. The teams were interrupted at halftime with a delay for a maintenance issue in the arena. The delay lasted for almost an hour, but the teams were able to finish out the game. The Black Knights were led by Madison Hovren, who added 17 points and grabbed a team high seven rebounds. Kate Murray recorded a season high 14 points off the bench and was 5-of-8 from the floor. Army shot 35 percent from the floor, but had difficulty hanging onto the ball as they committed 20 turnovers. Loyola had four players in double figures. Hannah Niles was 6-of-10, including 4-of-7 from deep, and had 17 points, while Stephanie Karcz was all over the court with 16 points, five rebounds, four assists and nine steals. Taleah Dixon added 15 points and Delaney Connolly chipped in with 11. The Greyhounds capitalized on Army’s turnovers with 25 points off of Army’s 20 miscues. The Greyhounds came out ready to play and had a 21-8 lead at the end of the first 10 minutes of action. Loyola really put on the pressure and hit shots during a 16-0 run over a six minute span to increase the lead. Dixon had six points during the run and Karcz and Connolly had four points in the six minutes. The home squad continued to build its lead in the second quarter and led 31-13 with 4:08 left in the half. Natalie Stralkus was the lone bright spot for Army in the opening minutes of the second quarter after she hit a deep three to cut into the lead. The Black Knights tried to chip away at the Greyhounds lead, but every time Army scored on its possession, Loyola answered. Especially Taleah Dixon who had two 3-pointers in the final three minutes to put the home team on top 39-20 at the break. After a lengthy delay at halftime, the teams came out to play the second half with empty stands, but Loyola kept its lead. The Greyhounds didn’t allow Army to get back into the game in the third quarter and led 58-37 at the end of three. Army got eight points from Murray in the frame, while Hovren scored added nine, but Loyola eight from Karcz to stay in the lead. The Black Knights outscored the Greyhounds, 14-12, in the fourth quarter, but Loyola came through with the 70-51 victory.